The MY-3 ( Many in One Zapper ) is a crystal controlled, microprocessor based, multi-frequency zapper designed with improved results in consideration. This Rife Zapper includes over 270 precise Rife/Crane and Clark frequencies, in seventeen Rife frequency modes in addition to The Clark Max frequencies and the ParaZapper MX frequency set, as well as 7 special individual frequencies, in one package at an affordable cost and has an output voltage that is only 0.2 volts less than the battery and it also has Pedestal offset which is better than just positive offset. The output is strong and this unit is intended for those uses that need a stronger output as well as more numerous and more accurate frequencies. While guranteed to be within +/- 0.05 percent Hz for all frequencies under 3000 Hz and +/- 0.1 percent for higher frequencies, this parasite zapper is usually +/- 0.1 Hz for most frequencies below 1000 Hz, 0.25 Hz for most frequencies below 3000 Hz, due to the precision of the crystal oscillator that controls the accuracy. The MY-3 includes new innovations, such as pedestal offset, that offer significant enhancements over other hulda clark zappers. It has a timer with a beeper to let you know when your cycle is done. It even includes a favorite mode option that allows you to set it to start up in any of the modes provided. While the frequencies contained in this Rife zapper are very specific to certain organisms, it should also be effective as a general purpose parasite zapper according to Dr. Clark's statements. For that reason, we have selected 14 Clark and Rife Frequencies in the 1 kHz to 2.5 kHz Clark range, 8 MX frequencies, and over 250 of the most important Rife frequencies for a total of over 270 frequencies to provide the greatest flexibility and the best available coverage in an economical, easy to use unit. Additionally, each of several modes has an alternate mode associated that allows the user to start the operation at either of two initial frequencies. The user can easily select to use half of one mode and then switch to using half of another mode. The MY-3 also has user selectable timing that applies to all frequencies. The frequencies for each mode are as follows in the tables below. MY3+10 has a 10.5 volt output for the life of the battery. Battery life is reduced with the 10.5 volt option. 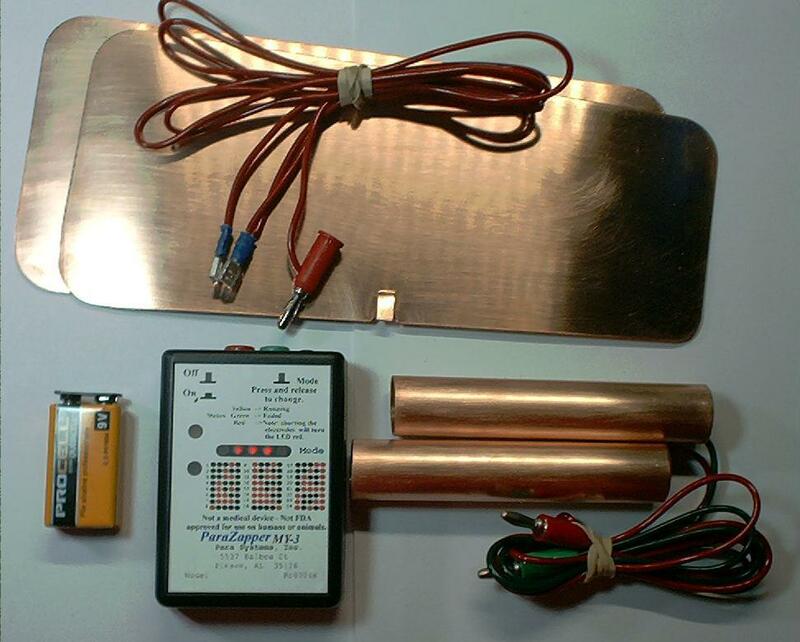 While not sold as a medical zapper, the frequencies may be similar to energy medicine. Better than Super Deluxe Zapper as it does not require extra modules. See the disclaimers posted below. Important! While the MY-3 can use the 7.5 minutes on, 20 minutes off routine that was originally suggested by Dr. Clark in any mode, it is not suggested as it has been found that the MY-3 works better when used in the continuous mode. Follow the timing suggested in the mode that you select to use. Disclaimer! While many of these frequencies are listed in various public sources and they are shown in this list as associated with certain specific microbes, we are not representing or claiming that any of these frequencies are effective against any specific microbes and do not make any claims for their use on humans or animals or for the treatment or cure of any disease or illness. This product is produced specifically for study and research on the effects of LVPEF on microbes in water. Any other usage is at the disgression of each individual and not the intent of the marketer. Mode 1 general purpose Mode 1 A starts here. Mode 1 B starts here. for the order in which they are generated. Mode 1 A cycles to Mode 1 B and Mode 1 B cycles to Mode 1 A. Either Mode will cycle through all 12 frequencies. The unit will provide a quick beep when cycling to the next mode. then the unit will wait 5 seconds and repeat the same sequence of frequencies. most units are within 0.5 Hz of the specified frequency in this range. Timing: The total minimum cycle time is 90 minutes at a cycle time of 7.5 minutes. A session of 90 minutes (1-1/2 hours)is recommended with a cycle time of 7.5 minutes. A session of 120 minutes (2 hours)is recommended with a cycle time of 10 minutes. Rife/Crane frequencies at 7.5 minutes each. The cycle time may be user selected for 1, 3.5, 7, or 10 minutes for all frequencies. It is recommended to use this unit at 7.5 minutes per frequency and go through all frequencies in one mode daily. Use the same mode for at least 1 week to 10 days. Mode 2 General purpose Mode 2 A starts here. Mode 2 B starts here. Mode 2 A cycles to Mode 2 B and Mode 2 B cycles to Mode 2 A.
most units are within 1 Hz of the specified frequency. Intended to augment the 12 Rife/Crane frequencies in Mode 1. Mode 3 Antibacterial and Antifungal Mode 3 A starts here. Antibacterial Mode 3 B starts here. Mode 3 A cycles to Mode 3 B and Mode 3 B cycles to Mode 3 A.
most units are within 2.0 Hz of the specified frequency. in the frequency list to kill bacteria. Mode 4 Antifungal Mode 4 A starts here. Antifungal Mode 4 B starts here. Combine with Mode 3A for a more complete set as these 6 frequencies affect both bacteria and fungi. Mode 4 A cycles to Mode 4 B and Mode 4 B cycles to Mode 4 A. Either Mode will cycle through all 17 frequencies. Timing: The total minimum cycle time is 84 minutes using a 7 minute cycle. A session of 84 minutes is recommended with a cycle time of 7.5 minutes. A session of 110 minutes is recommended with a cycle time of 10 minutes. in the frequency list to kill yeast, mold, fungi. Mode 5 Anti Viral Mode 5 A starts here. Anti Viral Mode 5 B starts here. Mode 5 A cycles to Mode 5 B and Mode 5 B cycles to Mode 5 A. Either Mode will cycle through all 10 frequencies. in the frequency lists to kill various virus forms at 7.5 minutes each. Mode 6 Anti Fungal Mode 6 A starts here. Anti Fungal Mode 6 B starts here. Mode 6 A cycles to Mode 6 B and Mode 6 B cycles to Mode 6 A. Timing: The total minimum cycle time is 98 minutes at a cycle time of 7.5 minutes. A session of 98 minutes is recommended with a cycle time of 7.5 minutes. A session of 130 minutes is recommended with a cycle time of 10 minutes. in the frequency lists to kill various mold and fungal forms. Mode 7 Mode 7 A starts here. Mode 7 B starts here. Mode 7 A cycles to Mode 7 B and Mode 7 B cycles to Mode 7 A.
frequencies at 7.5 minutes each. Mode 8 Clark Mode 8 A starts here. Clark Mode 8 B starts here. Mode 8 A cycles to Mode 8 B and Mode 8 B cycles to Mode 8 A. Timing: The total cycle time to produce all 14 frequencies is 105 minutes. A session of 105 minutes is recommended with a cycle time of 7.5 minutes. A session of 140 minutes is recommended with a cycle time of 10 minutes. provided in Dr. Hulda Clark's frequency list within a narrow margin. Mode 9 MX Mode 9 starts here. Mode 9 B HEP-B frequencies starts here. Mode 9A produces all of the same basic frequencies as the old ParaZapper MX. The unit will provide a quick beep after frequency 4 and after frequency 8. In this Mode, part B does not roll over to part A but loops back to the start of Mode 9b. Mode 9 A and Mode 9 B are independent of each other. Mode 9 A does not cycle to Mode 9 B and Mode 9 B does not cycle to Mode 9 A. Timing: The total cycle time to produce all 8 frequencies is 60 minutes. A session of 60 minutes (1 hour)is recommended with a cycle time of 7.5 minutes. A session of 80 minutes (1 hour 20 minutes)is recommended with a cycle time of 10 minutes. Mode 10 Special Mode 10 A ( P. klebsiella ) starts here. In this Mode, part A does not roll over to part B but loops back to the start of Mode 10a. Special Mode 10 B ( Helminths ) starts here. In this Mode, part B does not roll over to part A but loops back to the start of Mode 10b. Mode 10 A and Mode 10 B are independent of each other. Mode 10 A does not cycle to Mode 10 B and Mode 10 B does not cycle to Mode 10 A. Each mode will provide 4 quick beeps when cycling back to the start. most units are within 0.05 percent of the specified frequency. Timing: A session of 60 minutes is recommended with a cycle time of 7.5 minutes in Mode 10a. A session of 85 minutes is recommended with a cycle time of 7.5 minutes in Mode 10b. Mode 11 Special Mode 11 A ( Borrelia / Rickettsia ) starts here. Rife Special Mode 11 B ( Immuno Virus / TLV ) starts here. In this Mode, part B does not roll over to part A but loops back to the start of Rife Mode 11b. Mode 11 A and Mode 11 B are independent of each other. Mode 11 A does not cycle to Mode 11 B and Mode 11 B does not cycle to Mode 11 A. Timing: A session of 60 minutes is recommended with a cycle time of 7.5 minutes in Mode 11a. A session of 85 minutes is recommended with a cycle time of 7.5 minutes in Mode 11b. in the frequency lists to kill various viral forms. It is recommended to use this unit at 7.5 minutes per frequency and go through all frequencies in one mode at least once daily. Use the same mode for at least 1 week to 10 days. Mode 12 Special Mode 12 A ( Hepatitis C ) starts here. In this Mode, part A does not roll over to part B but loops back to the start of Mode 12a. Special Mode 12 B ( Hepatitis C 2 & 3 ) starts here. In this Mode, part B does not roll over to part A but loops back to the start of Mode 11b. Mode 12 A and Mode 12 B are independent of each other. Mode 12 A does not cycle to Mode 12 B and Mode 12 B does not cycle to Mode 12 A.
Mode 13 Special Mode 13 A ( Varicella Zoster ) starts here. In this Mode, part A does not roll over to part B but loops back to the start of Mode 13a. Special Mode 13 B ( HPV-5/6 ) starts here. In this Mode, part B does not roll over to part A but loops back to the start of Mode 131b. Mode 13 A and Mode 11 B are independent of each other. Mode 13 A does not cycle to Mode 13 B and Mode 13 B does not cycle to Mode 13 A.
Mode 14 Special Mode 14 A ( Epstein Barr virus ) starts here. In this Mode, part A does not roll over to part B but loops back to the start of Mode 14a. Special Mode 14 B ( Cytomegalo virus(CMV) ) starts here. In this Mode, part B does not roll over to part A but loops back to the start of Mode 14b. Mode 14 A and Mode 11 B are independent of each other. Mode 14 A does not cycle to Mode 14 B and Mode 14 B does not cycle to Mode 14 A.
units are within 0.05 percent of the specified frequency at frequencies below 3000 Hz. Timing: A session of 150 minutes is recommended with a cycle time of 7.5 minutes in Mode 14a. A session of 60 minutes is recommended with a cycle time of 7.5 minutes in Mode 11b. in the frequency lists to kill various microbes. It is recommended to use this unit at 7.6 minutes per frequency and go through all frequencies in one mode at least once daily. Use the same mode for at least 1 week to 10 days. Mode 15 Special Mode 15 A ( Bartonella ) starts here. In this Mode, part A does not roll over to part B but loops back to the start of Mode 15a. Special Mode 15 B ( Babesia ) starts here. In this Mode, part B does not roll over to part A but loops back to the start of Mode 15b. Mode 15 A and Mode 15 B are independent of each other. Mode 15 A does not cycle to Mode 15 B and Mode 15 B does not cycle to Mode 15 A. Timing: A session of 128 minutes is recommended with a cycle time of 7.5 minutes in Mode 11a. A session of 53 minutes is recommended with a cycle time of 7.5 minutes in Mode 11b. Mode 16 Special Mode 16 A ( Blastocystis ) starts here. In this Mode, part A does not roll over to part B but loops back to the start of Mode 16a. Special Mode 16 B ( Helicobacter ) starts here. In this Mode, part B does not roll over to part A but loops back to the start of Mode 16b. Mode 16 A and Mode 11 B are independent of each other. Mode 16 A does not cycle to Mode 16 B and Mode 16 B does not cycle to Mode 16 A. Timing: A session of 160 minutes is recommended with a cycle time of 7.5 minutes in Mode 11a. A session of 100 minutes is recommended with a cycle time of 7.5 minutes in Mode 11b. Mode 17 Special Mode 17 A ( Mycoplasma ) starts here. In this Mode, part A does not roll over to part B but loops back to the start of Mode 17a. Special Mode 17 B ( Herpes C ) starts here. In this Mode, part B does not roll over to part A but loops back to the start of Mode 17b. Mode 17 A and Mode 11 B are independent of each other. Mode 17 A does not cycle to Mode 17 B and Mode 17 B does not cycle to Mode 17 A. Timing: A session of 175 minutes is recommended with a cycle time of 7.5 minutes in Mode 11a. Mode 18 Special Mode 18 A ( Candida ) starts here. In this Mode, part A does not roll over to part B but loops back to the start of Mode 18a. Special Mode 18 B ( Suspected Cancer Virus ) starts here. In this Mode, part B does not roll over to part A but loops back to the start of Mode 18b. Mode 18 A and Mode 18 B are independent of each other. Mode 18 A does not cycle to Mode 18 B and Mode 18 B does not cycle to Mode 18 A. Timing: A session of 130 minutes is recommended with a cycle time of 7.5 minutes in Mode 18a. A session of 240 minutes is recommended with a cycle time of 7.5 minutes in Mode 18b. Mode 19 Mode 19 starts here. The unit will provide a quick beep when the Mode times out. After cycle completion, repeat the same frequency again. Mode 20 Mode 20 starts here. Mode 21 Mode 21 starts here. Mode 22 Mode 22 starts here. Mode 23 Mode 23 starts here. then the unit will repeat the same frequency. Mode 24 Mode 24 starts here. Mode 25 Mode 25 starts here. units that are priced under $1500.00 US. parasites or any other parasites for that matter. This unit is only presented as a tool for experimentation. Note: you can also try 7.5 minutes on 20 minutes off in any mode that you chose. You will, however, only get the first frequency in that mode. It is also possible to do 15 minutes on, 22.5 minutes on, 30 minutes on, etc. and repeat 3 times or even 4 times if a full session is not practical. The MY-3 unit does have automatic timing and recycling for each frequency but it does not feature an automatic shutdown. Power to the unit is supplied by a Alkaline or special Rechargeable 9-volt battery and is controlled by a push-on / push-off switch. The output voltage is near to the actual battery voltage and the battery can go down to 7.8 volts before requiring replacement or recharging. The MY-3+9 unit does have automatic timing and recycling for each frequency but it does not feature an automatic shutdown. Power to the unit is supplied by a Alkaline or Rechargeable 9-volt NiMH battery and is controlled by a push-on / push-off switch. The output voltage is near to 9.6 volts and the battery can go down to 5.5 volts before requiring replacement or recharging. The MY-3+10 unit does have automatic timing and recycling for each frequency but it does not feature an automatic shutdown. Power to the unit is supplied by a Alkaline or Rechargeable 9-volt NiMH battery and is controlled by a push-on / push-off switch. The output voltage is near to 10.5 volts and the battery can go down to 5.5 volts before requiring replacement or recharging. The MY3, MY3+9, and MY3+10 are identical except for the output voltage. They all operate on 9 volt batteries but the +9 and +10 units have extra circuitry to boost the voltage. No line connection or wall connection. Frequency selection is by momentary contact push button switch. To change modes, simply press the mode switch. The battery and mode LED's will both come on at the same time. Release the switch and the next mode will start. When the ON/OFF switch is pressed, the unit will come on and will first flash the timing selection for 1 second. It then turns on the center LED while it is waiting for the crystal oscillator to start. If the crystal oscillator does not start, the unit will reboot and try again. If the unit cycles repeatedly like this, there is a problem that requires factory assistance. Once the crystal oscillator starts, the unit always starts out in the Favorite Mode which in a new unit, is Mode 1A. The user may change the Favorite mode to any other mode at any time. Once a new favorite mode has been set, the unit will always start up in that mode. The status LED can be used to monitor normal operation and also to test the unit for correct operation. The Status LED will normally appear yellowish or orange but there are exceptions. If the battery is completely dead or missing, the LED will be off or dark. If for some reason, the output fails, the LED will either be solid green or red. To test the unit when operating, the unit should be on and operating with the copper paddles connected but not touching each other. In this condition, the LED will appear yellow or amber because it is flickering between red and green. A Red Status may indicate that the paddles are shorted together, however, if the red and green paddles are not shorted, a completely red Status means that you need to contact the factory for service. Touching the copper paddles together should cause the LED to show almost completely red due to the current load being pulled by the short circuit. This is an indicaton that the zapper output is functioning properly and providing sufficient output for best results. In certain frequencies ( 30 Hz and lower ), the RED and GREEN LEDs will ppear to flicker because of the low frequency. The LEDs actually flicker in all modes but they flicker faster than the eye can perceive. When the unit is first turned on, it starts in the Favorite Mode each time. The unit is shipped with the favorite mode set to mode 1A. Pressing this [Mode] button at any time will change from the current mode to the next mode in sequence and will also restart the timer. Pressing and holding the switch in until a beep is heard will program the mode as Favorite. When changing modes, if the Mode button is pressed for more than 2 seconds, the unit will beep and Favorite Mode will be erased. After the mode button is released, the unit will beep 4 softer beeps and then start in the Favorite mode that was selected and the unit will start in that mode each time the unit is turned on. Each time that the [Mode] switch is pressed, it will cycle to the next mode which can be observed by watching the Mode LEDs for the pattern produced. The Mode/Battery LED will flash either one or two flashes every 2 seconds. 2 Flashes every 2 seconds in Mode 1B through 8B. Mode 9 does not provide a B option. The mode LED flashes once or twice per every 2 seconds. consists of 5 RED LEDs that are turned on or off to show a code for the mode that it is currently operating in as described in the Mode table above. To set up timing and/or Favorite Mode, turn the unit off, Press the Mode button and while holding the mode button in, turn the unit on. Every couple of seconds, the unit will Beep and flash the LED's in the Mode Indicator array. Release the Mode button when the correct timing mode is selected. This should be followed by 4 soft beeps to indicate programming success. Now that the Timing is selected, you may change the default mode by pressing the mode button in. If the unit is currently in mode 1A. Each button press will advance it to the next mode selection, 1B, 2A, 2B, etc. It issues a series of beeps corresponding to the number of the mode selected each time the mode button is pressed and the mode is advanced. Modes 11 and 12 only beep 8 times. When you reach the mode that you wish to save as favorite mode, hold the button in until the the unit starts to provide a second set of beeps. Once the set of beeps has been started, release the button and the unit should remain in the selected mode and after the initial set of beeps, there is a second set of softer beeps to indicate programming success. If it switches back to mode 1A, the old data was erased and you just need to program the frequency the same way again. This time, the unit will remain in the favorite mode and the timing that you selected. It will also use these settings each time that you turn the unit on until it is changed. Automatic 20 minute rest timing is not included. Disclaimer: All statments and claims above are made in relation to killing microbes in water, such as protozoa, bacteria, fungi, algae, etc. for $459.00 US plus S+H. for $889.00 US plus S+H. Currently, the MY-3+9 and the MY-3+10 are available in limited supply at a price of $579.00 US plus S&H. Expect a 4 to 6 week lead time for the +9 and +10 versions. To Order, send us an email stating that you wish to order the MY-3+9 or the MY-3+10 and we will email back a link as we have production available. The MY3, MY3+9, and MY3+10 are identical except for the output voltage. They all operate on 9 volt batteries but the +9 and +10 units have extra circuitry to boost the voltage. No line connection or wall connection. Warning: Although Hulda Clark claimed her zappers could not reach internal organs, including the intestines, she did not use the advanced multi-frequency ParaZapper including the 4 point contact and 3 points positive. Since these devices demonstrate greater effectiveness in inactivating microbes like bacteria. protozoa, and fungi, and some individuals have chosen to use these ParaZappers for off-label personal use on their bodies, we have noted reports of doing so may destroy much of the natural, beneficial flora in the intestines. For at least one reason, it is very important to replace your microbiome with supplemental probiotics soon after using. Generally, consuming a good yogurt containing live and active cultures of at least 5 or 6 strains of bacteria will be helpful in any respect. The company does not endorse any off-label use but believes ethical companies should let the public know about potential issues involving off-label uses. Previous models of Hulda Clark Parasite Zapper, formerly available on paradevices and petzapper sites and since not as advanced as these models, those were considered to be superior to the other competing devices. The following statement is true for All zappers, regardless of where purchased, not just ParaZapper. Notice: On advice of counsel, we are required to inform you that the statements and claims on our web site have not been evaluated by the Food and Drug Administration and are not intended to diagnose, treat, cure or prevent any disease -- not for use on humans or with pets. These battery powered devices are not offered or intended for human use or to diagnose or prescribe for medical or psychological conditions nor to claim to prevent, treat, mitigate or cure any conditions, nor to recommend specific products as treatment of disease or to provide diagnosis, care, treatment or rehabilitation of individuals, or apply medical, mental health or human development principles. The devices discussed herein have not undergone evaluation and/or testing by the United States Food and Drug Administration or like agency of any other country. Risks which might be determined by such testing are unknown. The information on this site is not a substitute for medical or veterinary advice. Additional Notice: These devices are sold only for the experimental use of killing microbes in water. Any other usage is considered to be off-label and such usage is at the discretion of the user. This is not a Medical device and is not represented as such. We are having telephone problems. The calls often go to voice mail too quickly and we are having a problem getting the messages. Please Note that we do not sell by telephone but are happy to talk to you. Email is much better as: We often have 20 to 30 calls a day at 5 to 20 minutes each, and just can not answer them all without missing shipments. If inquiring about an order, please include the order number / Invoice Number starting with HCPZ, The transaction number is different and not in our system. EFAX = NO, we do not accept E-faxes due to possible risks.